Cars, like people, suffer in polluted environments. 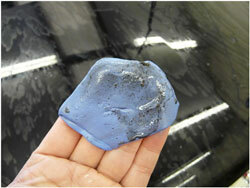 Unfortunately, there's not a lot that we can do to avoid the main contaminants affecting car paintwork. Industrial, metallic particles arguably cause the most damage. These particles can come from rail dust, brake dust, or as a product of industrial work. Metallic particles stick to the paint surface and then begin the process of corrosion and expansion, which distorts and damages the paint film. Although these particles may be microscopic, their presence can be felt as the rough texture on what may otherwise be a freshly cleaned car. These particles cannot be removed through washing and waxing alone in fact washing could increase damage further if you are using the incorrect tools. To effectively remove these imperfections you can use paint correction techniques, such as polishing or using a clay bar. Natural, organic matter can also be damaging to paintwork, with tree sap, insect residue and bird droppings causing the most damage. As bird droppings are very acidic, you should aim to remove them promptly. Leaving the droppings will allow them to burn into the paint surface and will make deeper damage more likely. Sunlight damages paintwork by causing oxidation. This can cause the paintwork to fade, and is most noticeable with red paint. This can be restored by polishing to remove the oxidisation, and then protecting the paint surface with waxes or sealants to minimise further damage. The most common form of paint damage are swirl marks, which are mainly caused by washing the car at an automatic car wash, or with a sponge (as grit gets trapped between the sponge and the paintwork, causing minor scratches and paintwork damage). Swirl marks cause light to deflect from the paint surface, dulling the paintwork and depth of colour. These can be fixed through the use of polishing compounds. 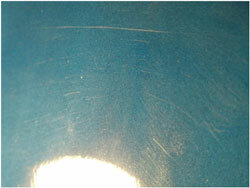 Buffer marks are caused by machine polishing, and are an unwelcome side effect of poor quality machine polishing. 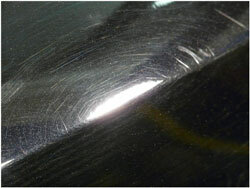 These marks can be removed in the same way as swirl marks, by polishing the paint surface. Depending on the depth of the scratch, many can be fixed in the same way as removing swirl marks, although possibly needing a more aggressive polish. If the scratches are not removed after polishing, then the next suggestion would be to wet-sand the area. You would then need to polish the area again afterwards to ensure a good finish. If the scratch still remains or you are presented with a deep scratch then you might have to look into repainting the area. Most often found on the bonnet or side panels, stone chips usually need a touch up pen in order to be concealed. A touch in pen applies a small amount of paint directly to the chip. Touch up pens are available from car manufacturers and some car parts suppliers. If they don't have your particular paint colour in stock, they can often be made up if you supply your car paint code. Once the chip has been repainted, wait for paint to dry completely before wet sanding the area to an even finish. If the area is in need of wet sanding, then it may be necessary to machine polish to blend the new paint in successfully.